Business Intelligence (BI) has experienced a paradigm shift over the past decade. With more data than ever before, access to the cloud, and interactive data dashboards and programs, business intelligence continues to adapt and evolve to meet the demands of analysts and businesses alike. The top trends shaping business intelligence in 2019 will change how analysts interact with data, open up new technologies to wider audiences, and propel BI programs forward. 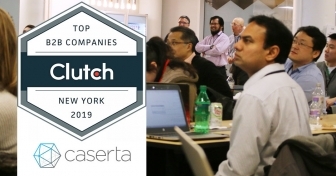 In our latest webinar, Srividya Bobji, a leading BI Consultant at Caserta, and Daniel Mintz, Chief Data Evangelist at Looker, shared their thoughts on the top trends shaping business intelligence in 2019, discussing everything from new jobs in the sector to the latest advances in machine learning. 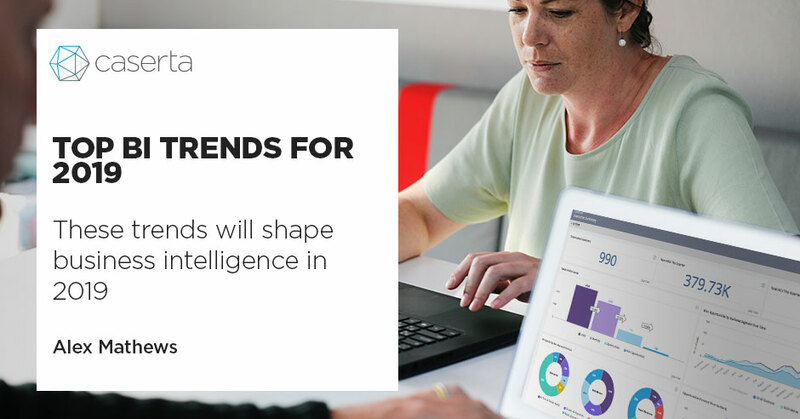 Continue reading to learn about the top trends that will shape business intelligence during the year. As analytics technologies become more advanced, companies will begin to use embedded analytics programs for their BI. As Srividya noted, “BI was always at the end of the business process lifecycle. Embedded analytics gives more maximum value on data.” Instead of aggregating data into a single, separate dashboard, embedded analytics programs integrate their analytic capabilities within specific applications, improving the analytics experience and making it easier for users to take action on new insights. More consumers than ever before are interacting with companies using personal digital assistants like Siri and Alexa or chatbots—but how can businesses derive actionable information from these conversations? Enter conversational analytics. Programs that use NLP to transcribe language and convert it into structured data to be analyzed for insights will become more prevalent in 2019. By allowing businesses to perfect their messaging platforms and AI systems to better serve consumers, conversational analytics provide “richer and more actionable analytics than traditional analytics,” says Srividya. With thousands of data sources and data points, it can be difficult for data analysts to pinpoint and implement actionable insights using existing business intelligence software. Augmented analytics will become a major part of business intelligence in 2019, shifting traditional business intelligence from gathering and aggregating data to using artificial intelligence to create actionable insights for users. Analysts will spend less time looking at their data and more time acting on the more accurate insights that augmented analytics provide. Generating measurable economic benefits from or attributable to available information assets. Whether directly monetizing data by sharing it for revenue or indirectly monetizing it using available data sources to identify new revenue opportunities, data monetization will prove to be an important business intelligence trend in 2019. In 2019, companies will begin forming data collaboratives to create public value. Beyond traditional public-private partnerships, data collaboratives bring together participants from different sectors who pool their data to solve public problems. 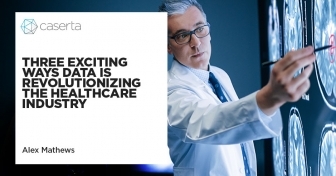 While more commonly used in the medical and environmental fields, data collaboratives will become more common throughout 2019. 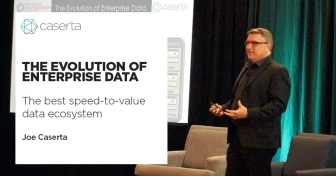 Data already plays an integral role in every business but its role will continue to grow. In fact, new data jobs you probably haven’t heard of before will become widespread very soon. Daniel notes that a “growing demand for data across the enterprise” will necessitate the creation of positions like the data project manager, who sits at the nexus of UX, data, and business; the data ambassador on the business side, who advocates for data; and the data translator, who translates information between business leadership and data analysts. “There is an enormous amount of data being created every day,” notes Daniel. With the proliferation of the Internet of Things and the democratization of big data, big metadata is also necessary to ensure that all the data being collected makes sense. As we collect larger and larger volumes of data, we need big metadata in tandem to tell data analysts what that data actually means. Look out for this business intelligence trend in 2019. In the past, Artificial Intelligence and machine learning were the domain of research academics and major corporations that could afford to pay the steep price to enter the market. The barrier to entry was too high for most companies to take advantage of the technology. Today, the tools needed to implement machine learning are easier and cheaper, even being built into business intelligence programs themselves. 2019 will see the continued democratization of predictive analytics as a result of this lower barrier to entry. Machine learning as a service products like Amazon SageMaker and BigQuery ML are making it easier than ever to implement machine learning models and algorithms in business intelligence. Leveraging your expertise in business intelligence and allowing MLaaS products to handle the complexities of implementing machine learning programs will be a business intelligence trend in 2019. To learn more about the trends shaping business intelligence in 2019, watch our full webinar.